If you build it, they might come...but if you blog it, it's no guarantee that they will read it. Every blogger wants a bigger readership. Many of us know the basics of good blogging: having error-free text, using a clean layout, writing valuable content...but one of the most overlooked aspect in growing your blog readership is being a good blog reader yourself. The first blog you should be reading is YOUR OWN BLOG. After you post, you should read and respond to people who make comments on your blog. One of the reasons people will make a comment is that they want to interact with you. If you do not reply, they may feel ignored and possibly will not comment again. People are more likely to read what YOU write if they know that you will read what THEY write! Take my friend Deb, who started a small little blog called Suburb Sanity. She started at roughly the same time I did and while I have a little over 200 regular readers of my personal blog, Deb has 1317!! Her average posts garner anywhere from 50-60 comments. Deb grew her readership and blog by replying to every single comment she got--often with incredibly witty or insightful remarks. That kind of exchange creates a compelling reason to return to the blog often and participate in its growth. Another way to encourage your readers to keep coming back and commenting is to reward them by reading and commenting on their blogs. In addition to sharing the love, this keeps you in touch with what your blog audience is writing about themselves: which will help you to create content that is tailored to your readership. You should comment on other blogs often. Choose blogs that have content somewhat similar to your own and comment frequently--this will get the attention of the author and other readers and some of them may come over to see what your blog is about. Also, if you become a loyal reader and responder on some blogs they may add you to their blog roll, which will generate even more readers for your blog. So don't just write---get reading!! 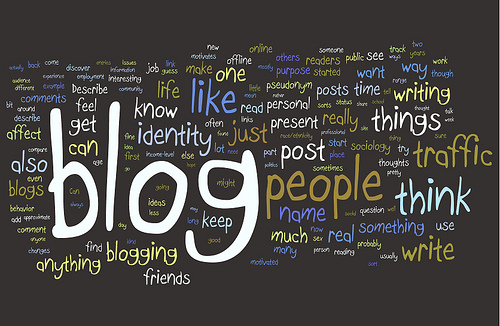 Let us know below what some of your favorite blogs to read are! Today my favorite blogs are Teresa Evangeline and The Block by Kittie and lots of other art blogs, but these two are real for today's world. You rock, Lorrie! Reading other people's blogs is my number one piece of advice to blog writers as well. Though it's hard to always take it myself! It's a matter of getting it into your routine. Once there, I've found I have a world of content and inspiration at my fingertips :) Not to mention the creation of lasting relationships! It's great advice, which I will definitely follow as soon I find the time to create content on my much neglected blog! Great advice, as always, Lorrie! Last night I was addicted to www.knackstudios.blogspot.com. It was so hard to tear myself away!